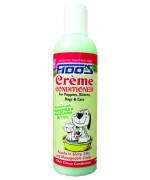 Fido's Crème Conditioner moisturises, freshens and adds gloss to any coat. The result is a shiny, silky and manageable coat with a fresh crisp apple fragrance. Specially selected natural ingredients include Chamomile, Macadamia Nut Oil and Aloe Vera.